We start off with one of our traditional grass fed legs of lamb. We take the bone and the fat out of the middle of the leg then tie it up. Leaving the little shand bone to hold onto which makes it 'easy to carve' which gives it it's name. About an hour and a half to 2 hrs at 170-180 degrees makes this mouth watering delight a hit all around. To save fights you can always order a couple of extra lamb shanks for the tray too. ey in a small bowl, season to taste and whisk to combine. Preheat oven to 180C. Place lamb in a roasting pan and brush with maple and honey mixture. Roast lamb for 1½ hours brushing frequently with maple and honey mixture, or until cooked to your liking. Rest for 12 minutes before carving, to serve. Save time and place your choice of roasting vegetables in a large roasting pan with lamb and cook at the same time. Remember to cut vegetables into large chunks and even so they do not over cook but cook nicely with the lamb. We start off with one of our traditional grass fed legs of lamb. We take the bone and the fat out of the middle of the leg then tie it up. Leaving the little shand bone to hold onto which makes it 'easy to carve' which gives it it's name. About an hour and a half to 2 hrs at 170-180 degrees makes this mouth watering delight a hit all around. Each roast weighs 1.4kgs - 1.8kgs. Please keep this in mind when ordering To save fights you can always order a couple of extra lamb shanks for the tray too. Try this recipe out... 1½ kg easy carve leg of lamb 80 ml (1/3 cup) extra virgin oil 60 ml (1/4 cup) lime juice 2 cloves garlic crushed 2cm piece ginger, finely grated 2 tsp ground cumin 3 tsp smoked paprika 2 tbsp maple syrup 2 tbsp honey Roasted Vegetables, to serve 1. Place oil, juice, garlic, ginger, spices, syrup and hon ey in a small bowl, season to taste and whisk to combine. 2. Preheat oven to 180C. Place lamb in a roasting pan and brush with maple and honey mixture. 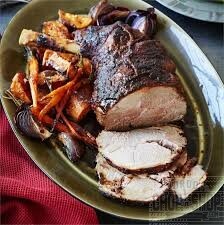 Roast lamb for 1½ hours brushing frequently with maple and honey mixture, or until cooked to your liking. Rest for 12 minutes before carving, to serve. 3. Carve lamb and serve with your choice of roasted seasonal vegetables. Save time and place your choice of roasting vegetables in a large roasting pan with lamb and cook at the same time. Remember to cut vegetables into large chunks and even so they do not over cook but cook nicely with the lamb.